A perfect match for custom printed napkins or personalized perper cups, our custom imprinted paper plates are a cheap and easy way to advertise your product or company! These Paper Plates are Great for picnics, tradeshows, dinners, and much more. Our personalized paper plates are sure to add a professional look to your next promotional event! 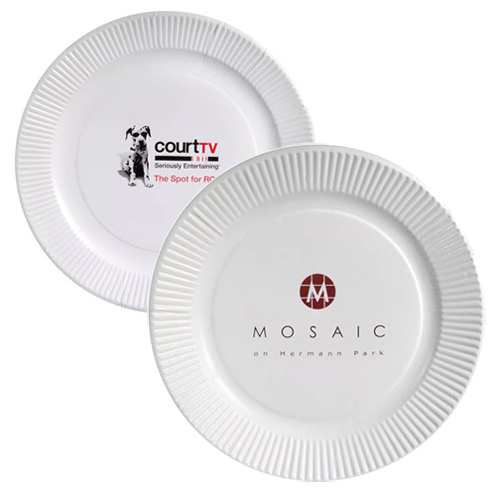 These custom paper plates are printed to your specifications, and are ideal products to advertise on a limited budget! Low Cost, High Value and Recyclable, our custom printed paper plates can be distributed in large quantities while getting your promotion out to more people in a more cost-effective way than most other advertisement tools. Our coated paper plates are available in 2 sizes, 7" and 9". Low in price, high in quality, you can't afford to pass up this great advertisement deal!